B.C. RCMP say that thieves risked their own lives in entering the evacuated landslide area at Johnson's Landing to steal tools and other items. Thieves broke first broke into a home and garage sometime last week, then made their way through slide debris to two other unoccupied homes, said Kaslo RCMP in a Tuesday news release. 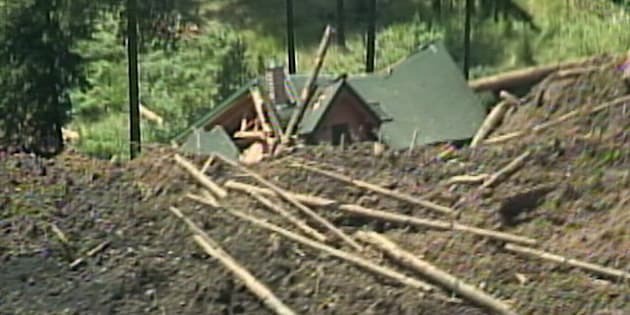 Last July, a devastating landslide swept through the tiny hamlet in southeastern B.C., killing four people. Due to the slide hazard, warning signs remain in place for the public not to venture into the area. The home belonging to Valentine Webber, 60, and his two daughters, Diana, 22, and Rachel, 17, who died in the slide, was broken into, said RCMP. Thieves took a riding mower, table saw, and air compressor from the property. They also stole computers and other tools from a second home. RCMP officers could not get to two other homes in the south side of the slide because of unstable ground. "It is indeed extremely unfortunate that not only were the property owners victimized by the original slide, but eight months later are victimized again by criminals stealing their property," said RCMP in the news release. UPDATE - March 21, 2013: A resident spotted the stolen tools and other items piled neatly at the side of Highway 31, about 18 km from the original break-ins, said RCMP. While the equipment has been recovered, there are still no arrests as the investigation continues.